Review posted February 6, 2019. Dial Books for Young Readers, March 2018. 267 pages. Review written December 3, 2017 from an Advance Reader Copy. The Night Diary is set in a time I knew nothing about: 1947 India, the part that became Pakistan. Nisha and her twin brother Amil live with her Papa and his mother Dadi and their beloved Kazi, the cook. Their mother died when giving birth to the twins. They are twelve now, and Nisha is writing letters to her Mama in a diary that Kazi gave her. Nisha’s Mama was a Muslim, but her Papa is Hindu and they live as Hindu, but Kazi is Muslim. Many didn’t want her parents to get married, but they moved to a place where all religions lived together peaceably. That is about to change. When the British left India, it was decided that they should partition India into two countries – Pakistan for Muslims and India for the remaining religions, particularly Hindus. So Nisha and her family need to move. Nisha’s father is a doctor and he listens to the ideas promoted by Gandhi. He lingers in their town probably longer than they should. Eventually, their journey to cross the border into India is fraught with danger. They have many brushes with death. On top of this, Nisha has trouble speaking to anyone who is not family. This will add to her challenges on the road. This book is based on the author’s father’s family’s experiences at the same time. It adds power that this story of refugees is based in truth. Sadly, refugee stories are always timely. As are stories about conflict between religions. I like the way Gandhi’s ideas of religions living peacefully together are included – though still showing the nonsensical side of hatred based only on religion. This is a powerful story, including brushes with death, but it’s all told from a child’s eyes and in a way a child can understand. 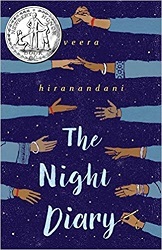 Here's what the Newbery committee said about the book: "Following introspective Nisha and her family as they flee their homeland for an uncertain future, Hiranandani illuminates the 1947 partition of India with unprecedented balance and sensitivity. Through spare evocative diary entries addressed to her late mother, Nisha discovers the complex beauty of her Hindu-Muslim identity."